The data from the listening device had to be available immediately after observation at a searchlight in order to be able to illuminate the observed aircraft immediately for the purpose of the operation of the anti-aircraft guns. Therefore, electric transmission was the best solution. As servo systems had not been invented yet, the Army used synchronous transfer. This required heavy, thick, and hard-to-handle cables. 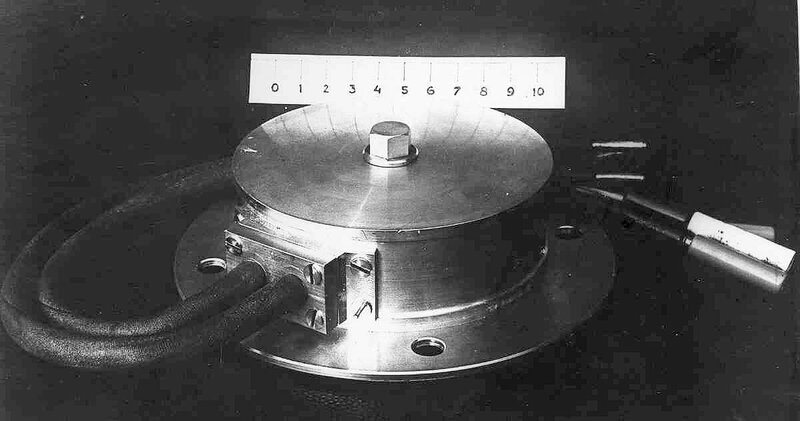 Van Soest developed a light-wired step system which transferred the data map angle and elevation using electric impulses. The development of this system started in 1928. The experimental position transmitter. The position is adjusted with the hand wheel and transmitted to the receiver. At the transmitting side, an electromechanical device was used. The mechanism separated the forward and backward movements of the axis. These movements were translated into separate series of plus (forward) and minus (backward) impulses. Both series of impulses were transferred with separate wires. The number of pulses was proportional to the angular rotation. The maximum transport speed of the Step system was 150 pulses (=steps) per second. The receiver converted the received set of pulses into a proportional forward or backward pointer on a clock-like device. The pointer moved 360 degrees (or 6400 artillery milli-radials) on a circular scale in 640 steps. By keeping the rotating mechanism under the mechanical pressure of an excited spring, the impulses in each wire could be reduced to 25 mA. 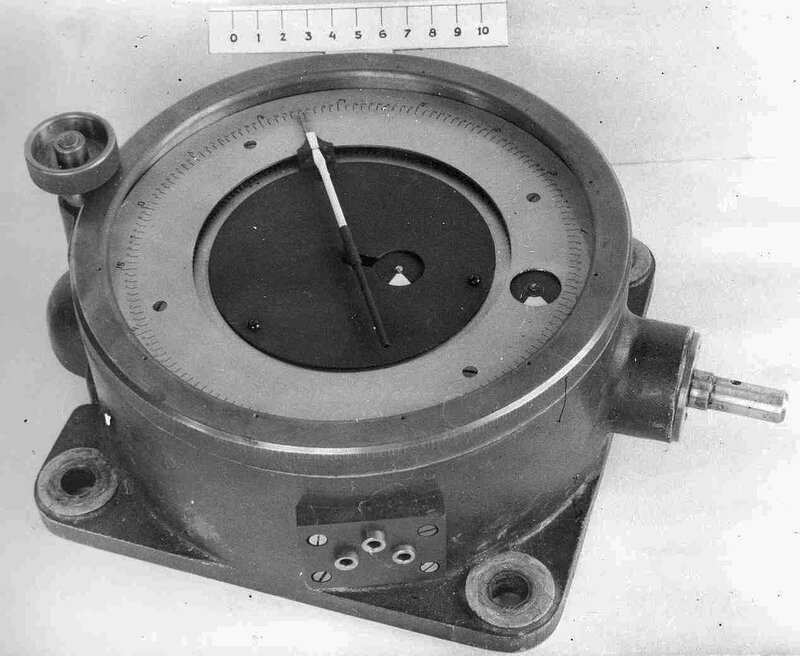 A hand-adjustable indicator had to aligned by hand with the indicated direction. Its orientation was transferred again with an alike transmitter as described above to the searchlight. The intermediate step allowed visual observation corrections using day or night binoculars. The receiver at the searchlight site provided the angle and elevation settings for the searchlight. The searchlight handwheels were manually aligned with the received map angle and elevation. In the end, the searchlight was in the same direction as indicated by the correcting device of the listening device with optional visual correction. In May 1929, the Artillerie-Inrichtingen (AI) started to develop the production model. They concluded that the Dutch watch-maker industry was not able to manufacture the specific clock part. AI proposed to outsource that part to foreign clock-making industry either in Zurich or the Black Forest(!). Together with van Soest, a business trip was made visit manufacturers in the Black Forest in November 1929. The Royal Netherlands Navy stated: It is not acceptable that the Step system is not automatically synchronous, that is to say, after a temporary switch-off or switch to another post it is automatically aligned without calibration. This was not a requirement for the anti-aircraft artillery [source: Annual report 1929 to the Commission for Physical Armorment of the Dutch Ministry of War]. In 1930, field tests were performed with a first step system provisionally screwed onto an anti-aircraft gun 7 TL . Thirty shots were fired with the step system target pointer being moved at the same time. No errors were found due to the shocks. 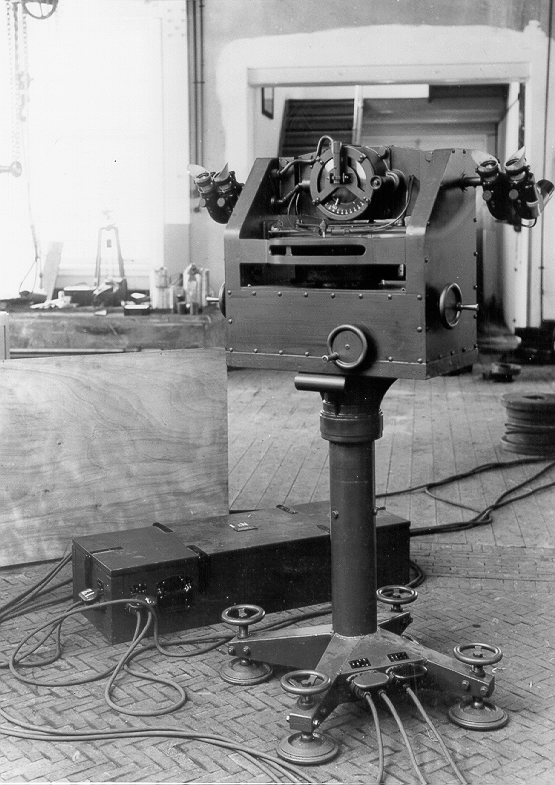 After the installation of the listening device at an operational location, the military had to align (“calibrate”) the listening device, viewing device, and searchlight devices. In other words: reset of the total system. The listening device was set on card angle zero (North) and elevation zero. The two subsequent transmitters and receivers were adjusted to zero as well. 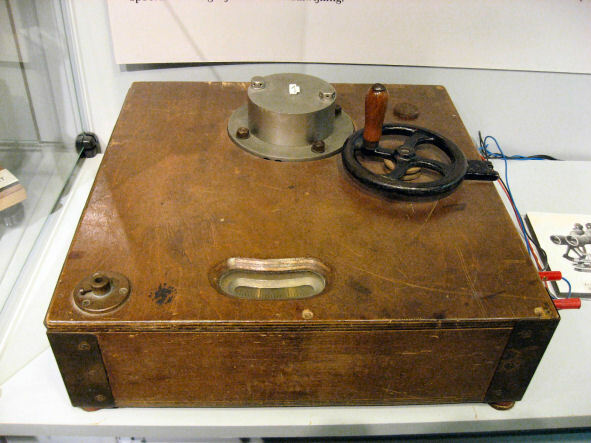 In practice, a viewing device was often used as a link between the listening device and the searchlight. The diagram below shows how these three devices were interconnected by the step system. The listening device transfers the values of map angle and elevation to the viewing device. The viewing device contained a day and a night binocular as well as two receivers for the receipt of the map angle and elevation values. 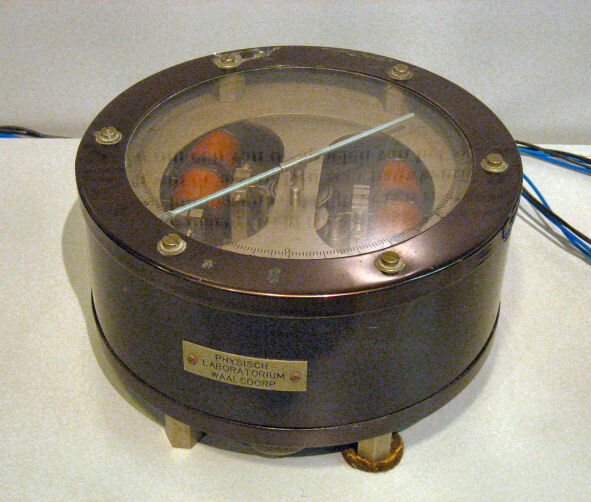 Two Step transmitting devices are used for forwarding the map angle and the elevation values to the searchlight. The handwheels put the searchlight in the right direction. The viewing device allows correcting any deviation between the observed plane location by the listening device and the visually observed location. 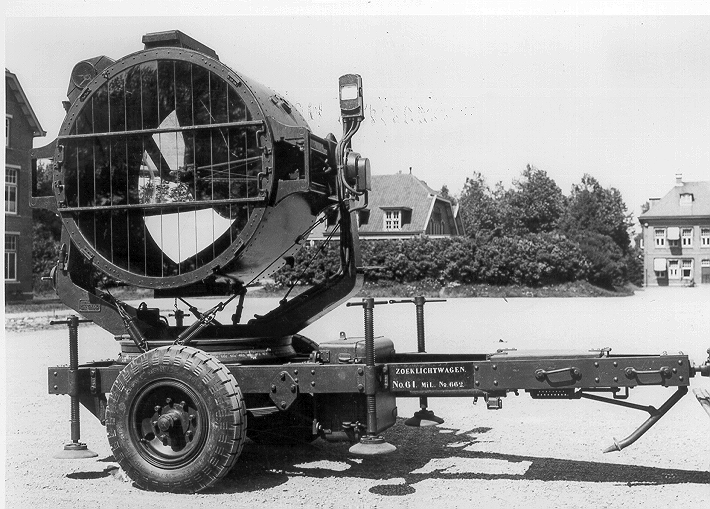 Because the listening device required a quiet environment, the viewer and the searchlight were positioned at a large distance of the listening device.